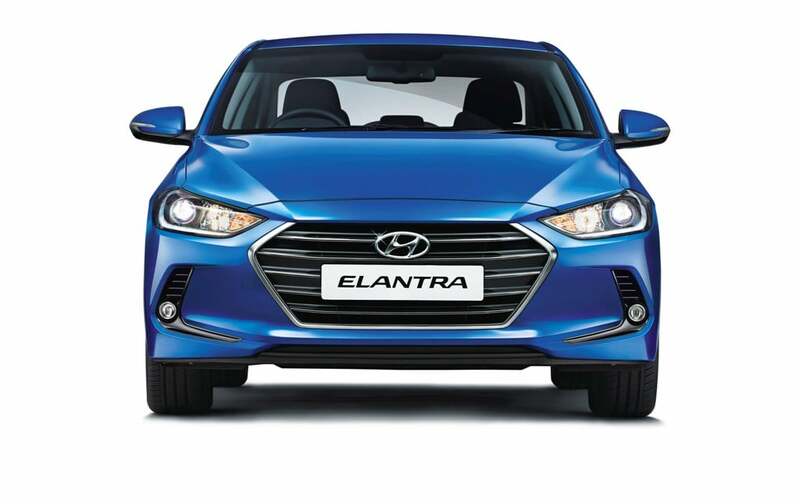 The 2016 Hyundai Elantra sedan is out from the factory and is available for sale in India at a starting price of Rs. 12.99 lakh. This global bestseller from the Korean carmaker receives radical updates on the outside and the inside and evolves as a good value proposition over its prime rivals. Unveiled at the Frankfurt Motor Show 2015, Elantra did not take much time to come on the roads. The 2016 Hyundai Elantra specs have been updated and it now promises an improved performance with new petrol and diesel engines. It also sports an all-new exterior that is clean and confident without being aggressive. The interior design has also been revamped and the cabin is now more driver-oriented, taking hints from Sonata. Among other changes, the rear suspension has been cleverly tweaked to make way for enhanced steering response and greater stability. Rich in features and luxuriously comfortable, New Hyundai Elantra, is here to give a close fight to its rivals like Honda Civic, Toyota Corolla Altis and Chevrolet Cruze. 2016 Hyundai Elantra specs are different from the outgoing model and it hosts all-new powertrains. 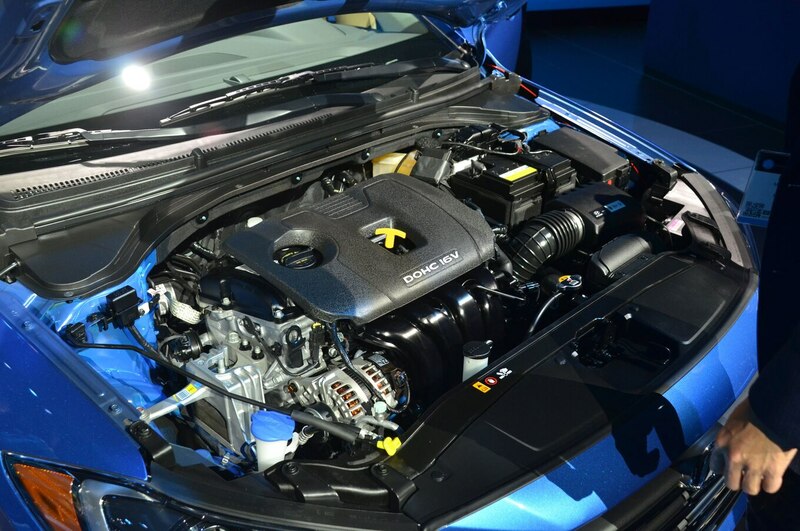 The petrol engine hosted by New Elantra is the biggest petrol engine in its class. Hyundai Elantra may not be particularly thrilling to ride but it indeed is very comfortable and enjoyable. The diesel engine is particularly synonymous with higher efficiency, low NVH levels and enhanced durability while the petrol engine is peppier and more fun to drive. The variable geometry turbocharger of the diesel engine ensures complete driving pleasure in the city as well as on Highways. The rear suspension geometry, as mentioned earlier, has been re-worked for a better performance. The car now gets Coupled Torsion Beam axle at the rear along with Hydraulic Rebound Stopper that helps in improved damping and a stabilized driving experience. The front Macpherson Strut suspension has also been improved to minimize vibrations. All this has paved way for a noticeably quieter and smoother ride. The manual and the automatic gearboxes are smooth to use and the latter more refined with reduced frictional losses. The ventilated disc brakes at the front and rear offer adequate bite and handle their responsibilities well. The steering offers a precise feel and results in effective handling. New Elantra is sleeker and sharper than before and has the most distinctive design among compact sedans. It follows the Fluidic design philosophy of the company and has an upmarket appeal. The new edition measures 4610 mm in length, 1800 mm in width and 1450 mm in height. It is now 40mm longer, 25 mm wider and 5 mm lower than the outgoing model. The lowering of height has helped improve the centre of gravity of the car thereby enhancing its aerodynamics. It has a wheelbase of 2700 mm and has a good ground clearance of 65 mm. 2016 Hyundai Elantra is based on an all new platform and is very different from its predecessor in terms of looks. The hexagonal grill at the front garnished with chrome accents has now become larger. New HID projector headlamps that incorporate LED daytime running lights look striking. Hyundai has also added new fog lamp housing in the front bumper. Coming to the side, the car flaunts new 10-spoke, 16 inch alloy wheels, along with electric sunroof with pinch guard, body coloured ORVMs with turn indicators. The rear has also been re-worked with features like spilt LED tail lamps, and a re-deisgned boot. Some may find the new edition of Elantra to be less bolder and expressive than the outgoing model but this new version is surely more aerodynamic and has been incorporated, it seems, to better the performance. It is available in a choice of five body colours namely – Sleek Silver, Phantom Black, Polar White, Red Passion and Marine Blue. The cabin has been nicely executed but in a subdued manner. 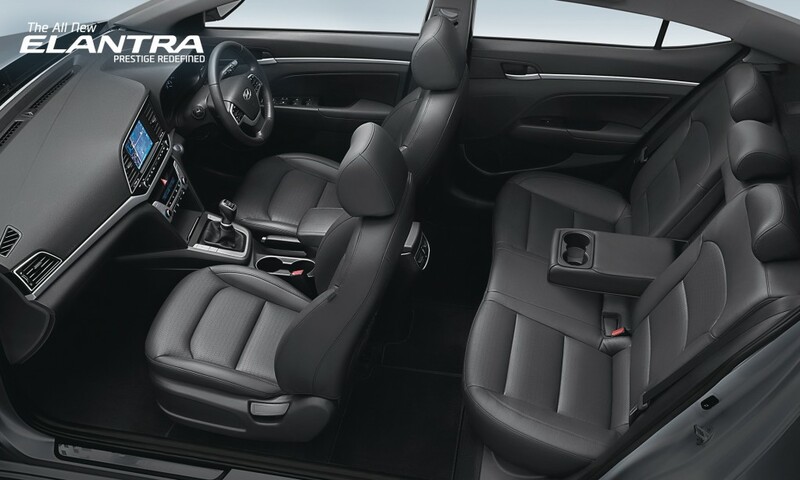 Inspired from Sonata, the New Hyundai Elantra interior is spacious and very comfortable. The cabin offers a nice blend of convenience and luxury. The new lay-out is quite remarkable, driver-oriented and pays special attention to detail. The T shaped centre fascia has been subtly tilted towards the driver. Silver detailing all over exudes a luxurious feel. It has ergonomically placed controls that help in convenient access to multimedia and also in parking. The steering wheel too is ergonomically designed with mounted audio, voice and cruise controls. A greater sense of space is also created by the wide design of the instrument panel. The front seats of the sedan are shaped for utmost comfort and all the seats have been made from environment friendly material called SoyFoam. Elantra offers ample shoulder room and legroom at the rear though the head room is just average due to its low height. The 458 litres of boot space lets you accommodate large suitcases and bags. The three-fourth folding rear seats help increase the boot space further. The Smart Trunk Feature hosted by this car enables opening of the trunk automatically. The user just has to stand behind the car for more than three seconds with the key in his hand. The list of features on 2016 Hyundai Elantra is sure to impress even the hardest of cynic. The company has upgraded the base touch screen from 4.3 inch to 7.0 inch. The navigation equipped models boasts of an even larger 8.0 inch touch screen. All the variants offer Android Auto and Apple CarPlay connectivity, that are being added for the first time on this car. It also comes with an eight speaker Infinity Stereo with Clari-Fi music restoration technology. This technology enhances the quality of digital music. 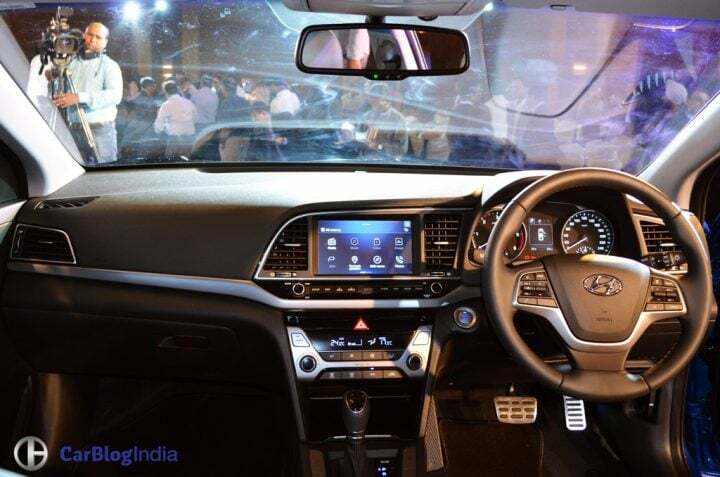 Other interesting features on board include Automatic Emergency Braking with Pedestrian Assist, Lane Keep Assist, hands-free trunk, heated leather seats, Smart Cruise Control, and Hyundai’s Blue Link Connected Car System. Elantra follows the “Safe Drive Philosophy” of the company and is made with 55% of Advanced High Strength Steel that increases the stiffness of the chassis. It guarantees effective protection of passengers in the event of a collision. Dual airbags, ABS and EBD come as standard features of the New Hyundai Elantra. The top variants offer advanced safety features such as six airbags ( front, side and curtain), Vehicle Stability Management, Hill Start Assist Control, rear parking sensors and Electronic Stability Control. Further, the new High Intensity Discharge(HID) headlamps considerably improve visibility at night. Front Projection Fog Lamps also come as a new feature apart from existing ones like Height adjustable front seat belts and Impact sensing door lock. Honda Civic has been a tough rival of Elantra and with the latest version of Civic releasing next year, Elantra 2016 has reasons to worry. The new Civic will sport a new design inside out, will be offered with two new engine options and at a competitive price. Both the cars stand neck to neck when it comes to features related to comfort and convenience technology. Elantra trumps Civic in the pricing department as the latter is priced higher in the range of Rs 15-20 lakh. 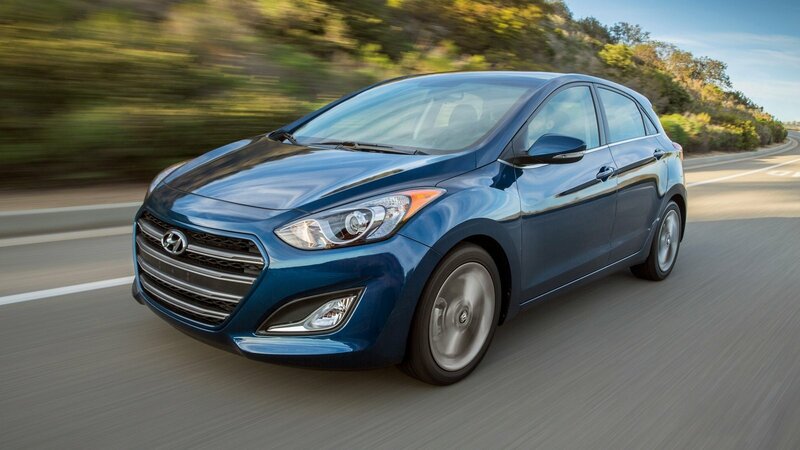 Elantra also faces stiff competition from Chevrolet Cruze. The recent price cut of up to Rs. 80,000 on Cruze makes it fall in the price bracket of Rs 13.95 – 16.95 lakh, making it an excellent value proposition when compared to Civic and Elantra. Elantra has come a long way just like the entire Hyundai line-up and 2016 Hyundai Elantra model is more powerful and efficient than ever. New Hyundai Elantra interior and exterior styling is second to none and it is stuffed with plenty of basic amenities. The car may seem to be a little underpowered when compared to its rivals but what it lacks in power, it makes up in economy and comfort. The new edition lives up to its reputation and does deliver good value. Next articleWill Jeep Wrangler 2016 Withstand the Land Rover Competition?